Serious silliness for all ages that's all about colours and items of clothing. The animals are getting dressed but the poor turkey just can't get it right! 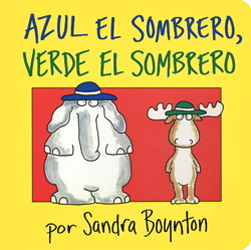 Azul el sombrero, verde el sombrero is written entirely in Spanish as it is aimed at native Spanish speakers. The language is very simple as it is aimed at young children.